Choose your fleet and meet at the races! 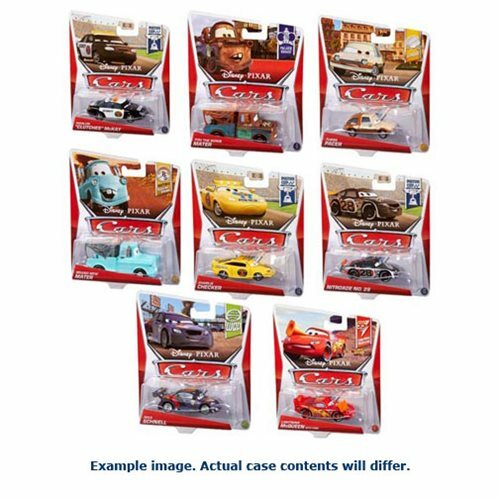 1:55 scale die-cast vehicles from the Disney-Pixar Cars movies. Featuring iconic details, charming personality accents, and wheels that roll. Mix 16 Case contains 24 vehicles. Enjoy the best racing and storytelling play from the Disney-Pixar Cars movies with this exciting range of 1:55 scale die-cast vehicles that include colorful hotrod competitors, Radiator Springs' locals and legends, and classic international celebrities! Each features iconic details, charming personality accents, and wheels that roll. They're the perfect size for push-around play and super cool to collect and display! Ages 3 and up.